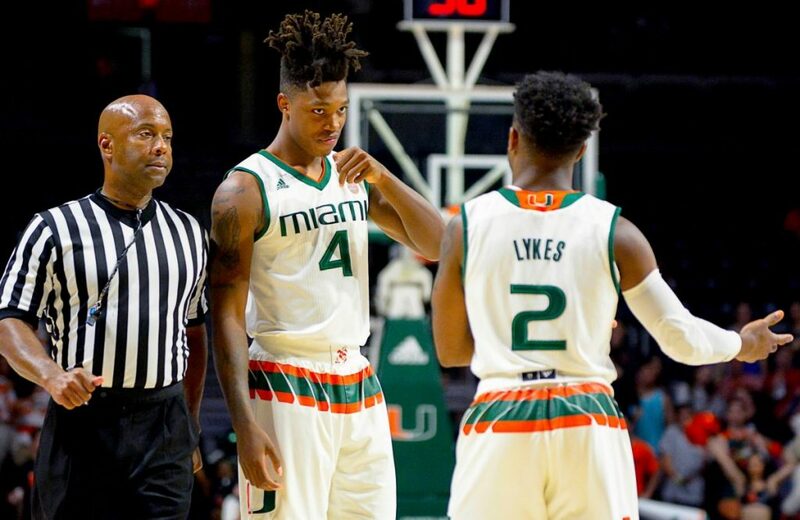 In Miami basketball’s 7-0 start to the 2017 regular season, freshmen Lonnie Walker IV and Chris Lykes have solidified themselves as consistent contributors in the lineup. The two guards have added to the Hurricanes’ already potent combination of shooting, elite athleticism and ability to beat defenders one-on-one. But like most first-year players, they have dealt with the inconsistencies that come with being new to a college game. Yet, neither has let the challenges change his demeanor on or off the court – they remain unfazed by pressure. Both Walker and Lykes attribute their composed personalities to their religious beliefs. “We have faith that God will take care of everything as long as you’re doing the right thing and being good, genuine people,” Lykes said. This devout trust in a higher power has minimized the worry Walker and Lykes, both practicing Christians, feel on a daily basis – whether it be for basketball or anything outside of it. And the fact they can confide in this lifestyle with each other has made all the difference in their lives. Walker’s favorite Bible verse is Isaiah 40:29, one that he cites often on social media. “He gives strength to the weary and increases the power of the weak,” the verse reads. In no situation did Walker refer to this verse more than when he was recovering from a torn meniscus in his right knee, which he suffered during summer workouts in July at UM. The injury kept him out for three months, and since then, it has taken Walker some time to get back into game shape and readapt to the flow of both the offense and the defense. But he never let the injury serve as an excuse. He quoted the verse on Instagram, while showing a picture of his right knee in a brace, saying he would be back better than ever. And sure enough, despite a slow start to the season, week by week, he has shown signs of why he was the highest ranked recruit in program history and is considered a future NBA first-round draft pick. Sophomore guard DJ Vasiljevic has taken it upon himself to be a leader and mentor the freshmen, and he has seen special traits from Walker, specifically during the rehabilitation process. Lykes’ favorite book of the Bible is the Psalms, and he spoke specifically about Psalms 23 and the impact it has on his outlook on life. The chapter references having a sense of peace and not fearing any evil – two things Lykes has always done quite well. “I don’t fear anybody on the court ­– I don’t fear anyone in general,” he said. Coming to Miami has been an adjustment process for Walker and Lykes, like it usually is for any freshman first coming to college. But having their faith, and being able to share it with each other, has made the path a whole lot easier.